I'm not sure what's going on with the weather this fall but I sure am liking it. Torontonians are notorious for complaining about our weather, it's too cold, it's too hot, it's too rainy... you name it. This Indian summer week we are having is sure to please even the most cranky residents. 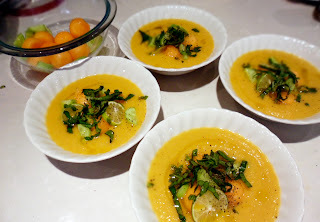 I figure since it feels like summer outside it would only be right to write about another delicious chilled summer soup. If you love cold fruity things you love this simple recipe. PREP: Puree cantaloup, cucumber, limes and evoo. *You can ball a few pieces of the melon for garnish in advance as well as thinly slice cucumber and lime - it's optional. Enjoy the weather while it lasts all!